Hello from Maria Elisa by Needles and Skeins! Here another Guest Post on Bettaknit’s blog! September is now arrived and for many of us this means only one thing: the end of summer holidays and… “back to school” or “back to work”! 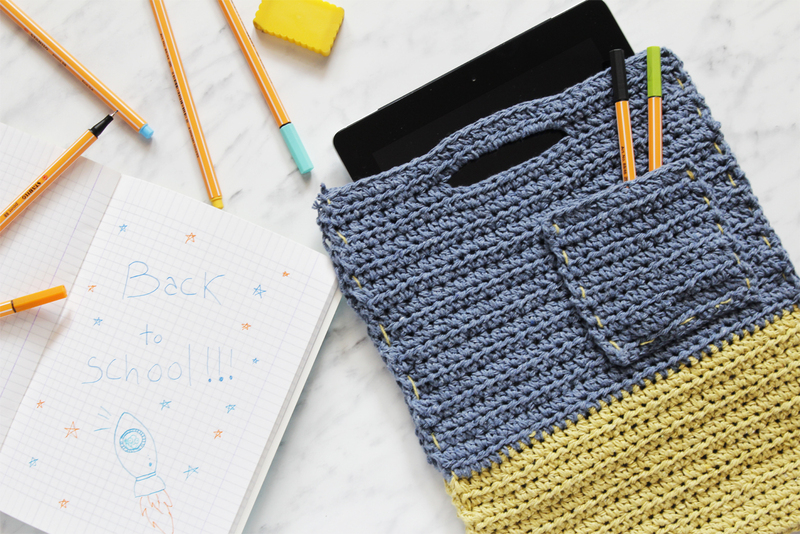 To make the “back to school” less traumatic here’s a new FREE PATTERN! 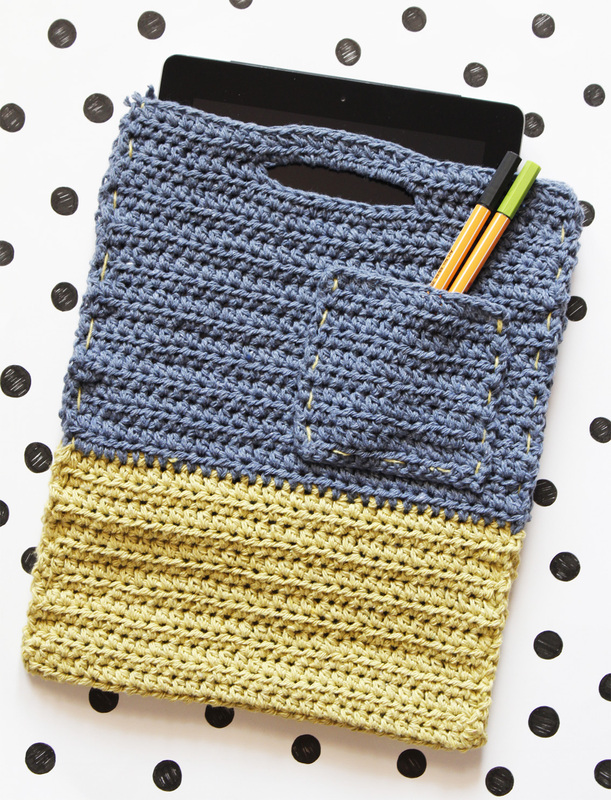 A crochet iPad cover, “Paddy Buddy“, practical and modern, to carry in style your electronic devices. The iPad cover is in two colors and it is very comfortable and easy to make. It’s essential to protect your tablet from the risk of scratching the screen when you bring it with you in your bag, but thanks to the handles it can also be comfortably carried by hands. It’s a “comfortable” cover beacuse in addition to the tablet there is also a little more space for a notebook or a little planner. It has in fact a small pocket on the front to keep pens or small items. Don’t you have a tablet? No problem! 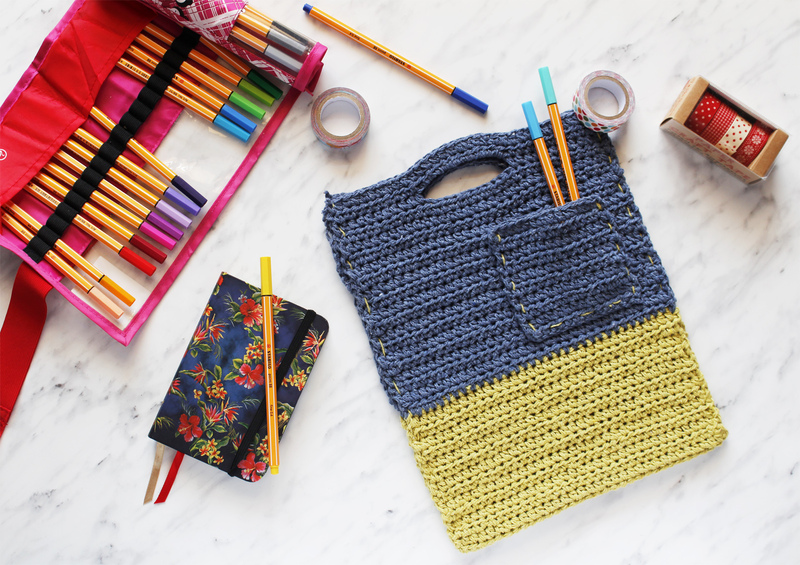 You can used it also for snacks, books, toys, and why not… to bring with you skeins, needles and crochet hooks! It’s really a buddy, the mate everyone would have! How can I make the iPad Cover “Paddy Buddy”? To make the cover I used Love my Jeans, a special yarn made from recycling old jeans. Find out more info about this special yarn, by clicking here! It’s crocheted two-ply and the irregularities in the color create a nice vintage effect… I chose the color combo Denim and Lime and I find it super cool! The contrasting stitching recall precisely the seams of jeans trousers. By the way… did you know that Denim Drift will be the color of the year in 2017? An accessory in this color is definitely a must have! What are you waiting for? Start now to crochet your own “Paddy Buddy Cover” and download the free pattern here! ….and you will receive a discount to buy the materials! We are always very curious to see your creations! So share your photos on Facebook, Instagram e Twitter using the hashtags #needlesandskeins #needlesandskeinsgang #bettaknit #ilovebettaknit!